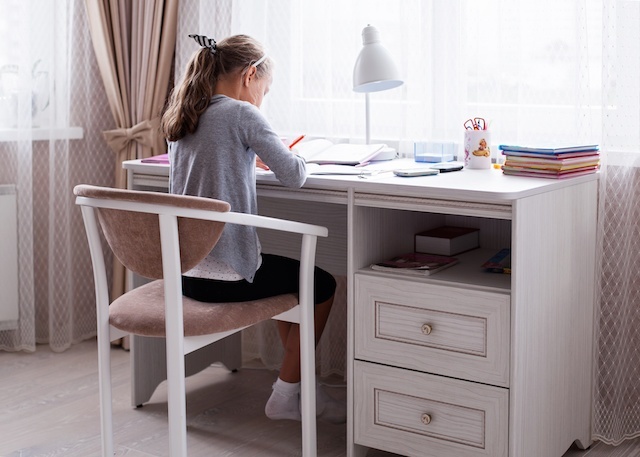 If your child struggles with organization and other aspects of executive functioning, you know that homework time can be one of the biggest challenges of the day. How many times does your child get up to grab a pencil, book or other item before actually settling down to business? How many interruptions are there during the work? If homework takes forever, you can help set your child up for success by creating a homework area that’s designed to help her stay focused. For starters, be sure to provide your child a desk or other work surface in a quiet space without distractions to use as a homework center. A public space, such as the living room or dining room, might be better than his own bedroom so you can keep an eye on his progress. If you choose a table that will need to be cleared later, provide a caddy with pencils, erasers, paper and any other supplies your child typically needs to do homework. Good lighting and a right-sized chair are also important. Above all, the surface of the table should be clear of clutter and visual distractions so only your child’s work takes up space during homework time. To create visuals that help your child break down tasks, label a piece of yellow construction paper "Get Ready," a green sheet "Do" and a red sheet "Done." Spread these on the homework table from left to right. Have your child gather all the materials she needs for an assignment and place them on the yellow sheet first. When she’s ready to move on to her green sheet, she can place the assignment on the paper as a placemat and complete the work. Finally, finished work is moved onto the red page, where it is checked for completion and accuracy before packing it up in her backpack. If your teacher has provided a model of what the finished assignment should look like, it can sit on the red card as a reference during homework time. This may seem very simple but remember: Visuals are a powerful way to help your child develop schema, or systems, in the brain for breaking down complex processes into simple steps. The stoplight colors of the get ready-do-done system are an easy way to help your child stay organized and on task for daily homework assignments. It can also be helpful to have your child talk through his thinking aloud as he works through the steps the first few times. Eventually, gathering materials and checking work should become a healthy study habit.